Megabuyte, November 2012. Original article here (£). The London startup ecosystem now constitutes at least 3,000 tech-focused companies, but possibly as many as 5,000, according to research by Charles Armstrong, the ethnographer and business innovator. Armstrong runs Trampoline Systems in Shoreditch, an award-winning social analytics software specialist, which maps companies’ internal and external relationships. But even he has been surprised at the speed and intensity of growth in the tech cluster around what is admittedly one of London’s grimmest roundabouts. 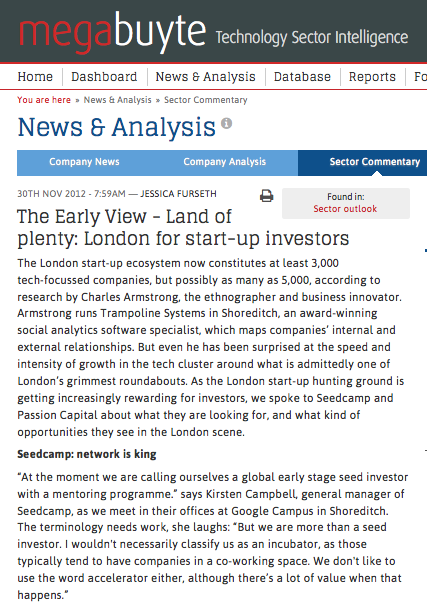 As the London startup hunting ground is getting increasingly rewarding for investors, we spoke to Seedcamp and Passion Capital about what they are looking for, and what kind of opportunity they see in the London scene. Regardless of what Seedcamp will end up calling itself, the fact remains that a host of hot startups can be traced back to the five-year-old programme. These include fashion data expert Editd, peer-to-peer currency exchange group Transferwise, and Playmob, the charity and gaming link-up specialist. Seedcamp’s standard investment is €50 000 for a 8-10% stake, alongside a year-long support programme with access to leading events and mentors. Similar initiatives include Springboard in Europe and Y-Combinator, 500 Startups and TechStars in the US, which support early-stage companies for a limited time while preparing them to raise their next round of funding. This may seem very neighbourly of Seedcamp, but these are actually a very choosy bunch. Operating exclusively on an events- and applications basis, last year Seedcamp got 2000 letters, from which they selected 200 for personal meetings before choosing 20 for investment. “So that gives you an idea of our process, but if you’re talking about quality, we could probably invest in more. There are certainly companies that have applied to Seedcamp and not been picked that have gone on to raise money elsewhere,” says Campbell, pointing out how Christian Thaler-Wolski, Wellington Partners principal and Seedcamp mentor, kept track of a company he met at Seedcamp Berlin last year. Bonusbox, a Facebook-based shopping portal, didn’t get into the Seedcamp programme, but Thaler-Wolski ended up contributing to their funding. But with companies like Seedcamp being quite exclusive, is there enough money going around in London to fund the good startups? Campbell thinks for a moment: “I guess it depends on how well networked you are, and what investors think of your capabilities. But if you have a strong team in London, Berlin or another hub, I don’t think companies struggle too much to get investment. There seems to be a boost at the moment, there are so many angel networks pitching events.” Right now, Seedcamp is present at ‘How to Web’ in Bucharest, ‘LeWeb’ is coming up next week in Paris, and last week there was an event in Vienna. And investors do go to these events, says Campbell, as well as big corporates such as Microsoft and Facebook, ever keen to see what’s happening on the ground. She points out how co-working community TechHub held an event at Campus earlier in the week; it was meant to be a casual night for founders to test their demos, but investors still managed to sneak in. For startups, Campbell recommends researching which investor is most suitable to your specific situation and target that shortlist. “Look at the size of deals they typically do to make sure they can give you the amount you are looking for. Look at which sectors they like: for instance Notion Capital likes to invest in B2B software, and Anthemis likes fintech.” Campbell is also a fan of AngelList, the San Francisco-based online network for connecting startups with angel investors. A similar initiative is London-based Seedrs [who we met in September], where companies can reach out not just to angels but anyone else who’d like to invest. There are nearly 18,000 business angels out there in the UK, most being registered by The British Business Angel Association. The $60m Passion fund has only been around since April 2011, but founders Stefan Glaenzer, Eileen Burbidge and Robert Dighero have been busy. Out of 1500 possible investments in the first year they ended up with 20, including real-time analytics group GoSquared, direct debit innovator GoCardless, social micropayments outfit Flattr, and Pusher, a programming interface for adding scalable functionality to apps in real time. Glaenzer thinks the quality as well as the quantity of startups in London, and Europe overall, has increased, and a lot of this can be traced back to the growth in the overall scene: “The ecosystem is getting better. Go back 6-7 years there were 3-4 digital companies around the roundabout. Now there’s over 3000 in 1.5 square miles.” Of course not all the startups are good, adds Glaenzer, but the increasing mass improves the networking and funding opportunities. London is the world’s seventh most influential startup ecosystem, according to an interesting new report from Telefonica Digital and Startup Genome, after Silicon Valley, Tel Aviv, Los Angeles, Seattle, New York and Boston. The ‘Startup Ecosystem Report 2012’ surveyed over 50,000 entrepreneurs in an effort to understand how their locations played a hand in their progress. Diverse talent, good support networks, lack of red tape around company creation, and supportive capital structures has made London the biggest hub in Europe, but it still has 70% less “risk capital” available for early-stage startups than the Valley. Posted on 12/07/2012 by Jess. This entry was posted in Technology features and tagged london, startup hub. Bookmark the permalink.